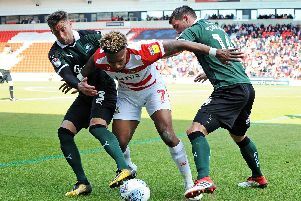 Doncaster Rovers midfielder Ali Crawford hopes his impending reunion with Alex Neil will not be such a happy one for his fellow Scot. Crawford played under Neil at Hamilton Academical. The 27-year-old is set to retain his place in the Rovers side for Sunday’s FA Cup third round trip to Preston North End, managed by Neil. While Rovers go into the tie in excellent form, the Lilywhites have an injury pile-up and are likely to prioritise Championship survival. Crawford is looking forward to a catch up with his former boss but says him and his teammates fancy their chances of causing an upset. “Alex Neil was excellent and I had a great season under him at Hamilton,” he said. “It’ll be great to catch up with him and hopefully we can get one over them and progress into the next round. “We’re high on confidence and there’s no reason we can’t go there and get a positive result. “We’re going in as underdogs but if we play like we did against Rochdale we’ll have a very good chance of progressing into the next round. “It’ll be an exciting game going to play someone who is in a higher league than us. “The pressure is not on us. Crawford scored a stunning free-kick in Rovers’ 5-0 win over Rochdale on New Year’s Day and his all round play has got stronger and stronger with more game time. The former Hamilton star wanted to test himself down south after spending his entire career in Scotland, and he is pleased with how he has adapted to the EFL. “I wouldn’t say it’s been easy,” said Crawford. “Obviously I got injured in the first game of the season. “And then being at a new club and not really knowing anyone for the first couple of months when I was injured was tough. “But now I’m back in the squad it’s been good. “It always helps when you’re winning games and scoring goals. “It’s going well and I think it’s one of the reasons the manager brought me to the club because he knew I would fit into the system he plays,” he added. “He gives you the freedom when you’re on the ball to express yourself and when you haven’t got the ball it’s all about hard work and getting it back as quickly as possible. Young striker Tyler Smith, who this week joined Rovers on loan from Sheffield United until the end of the season, is cup tied. Joe Wright, Niall Mason and Shaun Cummings are still sidelined through injury.